While we associate Miller with his dominant pass-rushing ability, he’s also one of the top run defenders in the NFL. His 94.4 run-defense grade was the best of any edge defender in 2017, while his 9.3 run-stop percentage was second in the league among 3-4 outside linebackers. The key addition here is rookie Bradley Chubb, who produced a 11.0 run stop percentage in his final season at NC State, ranking second in the draft class among 4-3 defensive ends. At linebacker, Davis was the 15th–highest graded linebacker in the league last year when it came to his work in the run game. The Patriots defense was already talented against the run, with Brown and Flowers ranking among the top 20 players at their positions on the defensive line in terms of PFF run-defense grade. They got even better this season by adding defensive tackle Danny Shelton from the Cleveland Browns. Shelton ranked 17th among defensive tackles with a run-stop percentage of 9.5 last year and had the 19th-highest run-defense grade among interior defensive lineman at 81.5. It’s no surprise that the Vikings talented defense ranks so highly here, especially when they have a force against the run like Joseph on the defensive line. Joseph ranked tied for fifth in the league among interior defensive linemen with a PFF run-defense grade of 89.0 and is in the conversation for the best run stuffer in the NFL not named Damon Harrison. Edge defender Danielle Hunter produced a run-defense grade of 84.3, ranking 17th among edge defenders, giving a nice boost on the outside. On the back end, Smith makes an impact against the run, ranking 15th among safeties with a 7.4 run-stop percentage when lined up within eight yards of the line of scrimmage at the snap. The Buccaneers have revamped their defensive line heading into 2018, and it bodes well for their success against the run. Their top draft pick was Washington’s Vita Vea, who ranked fourth among all draft-eligible defensive tackles with a 12.1 run-stop percentage. 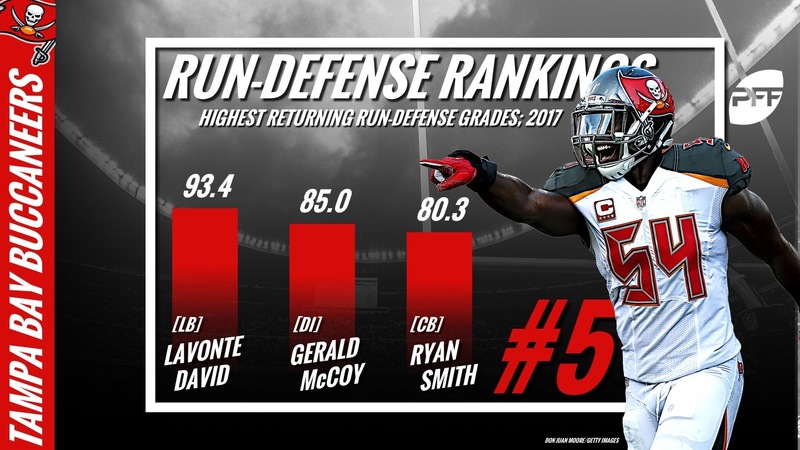 At linebacker, David produced the second-highest run-defense graded in the NFL among linebackers at 93.4, while Kwon Alexander was tied for 10th among inside linebackers with a 10.0 run-stop percentage. The Ravens are stout up front and it starts with their players on the defensive interior. Williams was tied for the fifth-highest run-defense grade among interior defensive linemen at 89.0, and ranked third among 3-4 defensive ends with a 11.0 run-stop percentage. At nose tackle, Pierce was fifth among defensive tackles with an 11.8 run-stop percentage, while he ranked 17th among players on the defensive interior with a PFF grade of 86.4 against the run. Suggs has been one of the top run defenders in the NFL throughout his career and despite his advancing years, still ranked 10th among edge defenders with a PFF grade of 87.4 last year. They have one of the top pass-rush units, but don’t sleep on how good the Jaguars defensive front looks set to be against the run in 2018. Smith was the top-graded run defender among linebackers last year at 94.1 and produced a 9.9 run-stop percentage, third among 4-3 outside linebackers. Up front, just like he dominated as a pass-rusher, Campbell dominated against the run too, finishing 2017 as the fourth-highest graded edge defender against the run. Despite the fact that they lost interior defensive lineman Mitch Unrein to the Buccaneers in free agency, this is a unit still set up to be tough to run on. 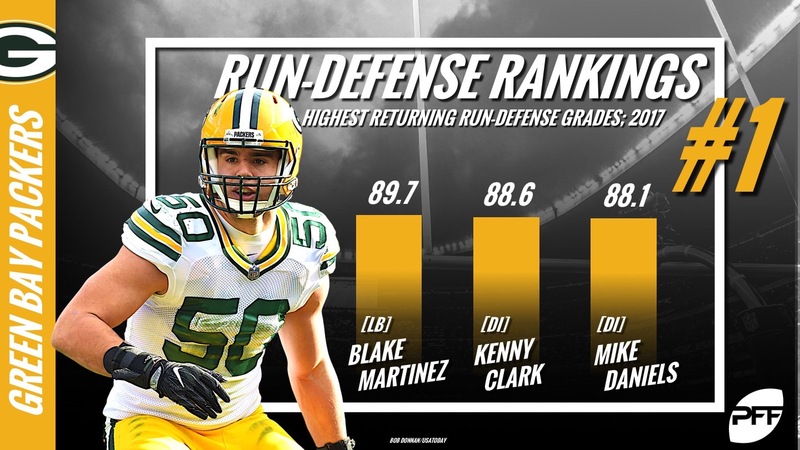 Hicks produced the eighth-best run-defense grade on the defensive interior. On the back end, Amos was the fourth-highest graded safety against the run and was tied for 22nd in the league with a run-stop percentage of 6.7 percent when lined up within eight yards of the line of scrimmage. Add in the addition of talented rookie linebacker Roquan Smith, and the Bears front seven should once again be tough to run on. Like Von Miller, generally Mack is most associated with rushing the passer, but he’s also elite at setting the edge and finishing run plays when he needs to. His run-defense grade of 92.9 was tied for the second-best among edge defenders last year, and his 11.2 run-stop percentage was the best in the NFL among 3-4 outside linebackers (Mack split time between standing up and putting his hand in the dirt for much of the year). They added Maurice Hurst in the draft, and if health allows him to get on and stay on the field, the Raiders are adding a player who ranked ninth in the draft class with a 10.4 run-stop percentage. Interior defensive lineman Muhammad Wilkerson left to join the Packers this offseason, but a key addition of their own should see run defense be an area of strength for the Jets. Avery Williamson joins the team after ranking 25th among inside linebackers with an 8.8 run-stop percentage a year ago. The loss of Wilkerson hurts, but they still have Leonard Williams on the defensive line, who was solid in 2017, but ideally should get back to the dominant work in run defense, which we saw in 2015 and 2016. Gone is Shelton, but there is still a lot of talent on the Browns defense when you look through their roster. While Garrett’s rookie campaign was limited to 518 snaps due to injury, he looked impressive against the run when he was on the field with a run-defense grade of 84.8 that was tied for 15th among edge defenders. Even better news for the Browns is that the player he was tied with at 15th, was their own in Nassib. Larry Ogunjobi was a force against the run in his first season in the league, producing a 9.5 run-stop percentage that was tied for 17th among defensive tackles, and the exact same mark produced by Shelton a year ago. At linebacker, Joe Schobert made first contact with the runner on 66 plays, more than any other defensive player in the NFL. The Browns allowed a league-best 0.88 yards before contact in 2017, and they have a shot to be just as good, if not better in 2018. The Titans were one of the league’s best run defenses a season ago in terms of yards per game (88.8) and yards per carry (3.6). Gone though is enforcing linebacker in the aforementioned Williamson who earned the sixth-highest run defense grade of any off-ball linebacker a season ago (90.1). Still, Woodyard and Casey will be enough to carry a stout run defense in 2018. The Eagles run defense should take a little bit of a hit in 2018 with the loss of Mychal Kendricks, who had a career-high 87.4 run-defense grade last season. Their front-four is so talented that they can treat the run as an afterthought and still stop it at a high-level. Guys like Graham, Cox, Jernigan and now Michael Bennett (83.5), simply create too much disruption up front. Much of the Bills success against the run in 2018 will come down to the play of rookie linebacker Tremaine Edmunds and free-agent nose tackle Star Lotulelei. The former was far more advanced in coverage last year at Virginia Tech than against the run, but he was no slouch at the latter. His 12.5 run-stop percentage ranked 13th nationally. Lotulelei, on the other hand, hasn’t been a force as a run-stopper since his rookie season. Ever since he notched a 12.9 run-stop percentage in his debut season, Lotulelei has yet to even crack 8.0 percent since and hit a low of 1.7 percent back in 2016. The Redskins gave up more rushing yards than any defense in the NFL last season, but there are two big reasons hailing from Alabama that make us think that will change. The first is Jonathan Allen likely playing more than 159 snaps this year. The other is rookie first rounder Da’Ron Payne replacing Ziggy Hood on the nose. We don’t know whether or not Payne will be great in the league, but there’s zero doubt in our mind he’ll be much better than Hood and his 35.1 run-defense grade. With a sub-300 pound nose tackle and 230-pound linebackers, the Falcons front-seven is not built to stop the run. In the current version of the NFL though, there’s absolutely nothing wrong with that. That being said, they’re quite adept at shutting down wide runs with their athleticism and penetrating into the backfield. The Panthers are another team that quite obviously prioritizes athleticism and coverage from their linebackers over downhill run-stuffing ability. There’s still no better linebacker against the run though than Kuechly who once again earned a 92.0 run defense grade last season. Their front-four is keyed by Short who earned a near-elite run-defense grade himself. 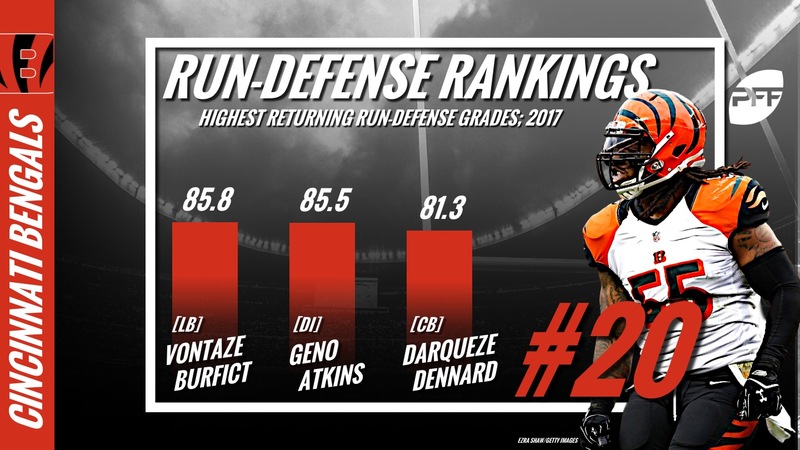 The Bengals run defense without Burfict in the lineup a season ago was a nightmare. The highest run-defense grade from a linebacker not named Burfict that received significant playing time was 42.5. Hopefully that will change this season with Preston Brown and his 72.5 run-defense grade coming over from Buffalo. The Rams entire run defense comes down to their interior trio of Donald, Brockers and Ndamukong Suh. There’s not a single other plus run defender in that front-seven, but with how dominant those three are, no one can count out the Rams outperforming this ranking. Edge rushers Joey Bosa and Ingram are both more than capable of stop the run if need be, but both sold out more as pass-rushers in 2017. They had one of the better run defenses in the NFL back in 2016 while Bosa and Ingram both had superb run grades. Ingram dropped off to an 82.5 run defense grade this past season while Bosa went to a 74.6. While their run defense suffered, the overall effectiveness of the defense improved greatly. The Cardinals can bank on Markus Golden’s return to the starting lineup making an impact on their run defense in 2018. Back in 2016, his 8.7 run-stop percentage was fourth-best among 3-4 outside linebackers. It will be interesting to see how the Cardinals’ run defense looks under new defensive coordinator Al Holcomb, though. Under Bruce Arians, Arizona was very active in adding their safeties to the run defense while Carolina – where Holcomb is coming from – has been far more content to let their front-seven do the work. The Seahawks simply lost too much talent up-front to not see a drop off in their run defense. Sheldon Richardson and Michael Bennett combined for 47 run stops a season ago and had the two highest run-defense grades along the Seahawks defensive line. While the Lions defensive ends (Zettel and Ziggy Ansah) are talented run defenders in their own right, the interior still looks like a mess against the run. The only change was the addition of Sylvester Williams, who only notched a 6.7 run-stop percentage a season ago. The Saints run defense took a drastic hit when defense end Alex Okafor went down for the season last year. He notched 27 run stops in only 10 games last year – a figure that still led all Saints defensive linemen. There’s only so much he and Jordan can do though to protect one of the league’s worst linebacking corps versus the run. The 49ers run defense rank suffers here from the lack of a true nose tackle. Earl Mitchell’s 5.0 run-stop percentage was the worst of any player in the NFL last season that had at least 300 snaps against the run. 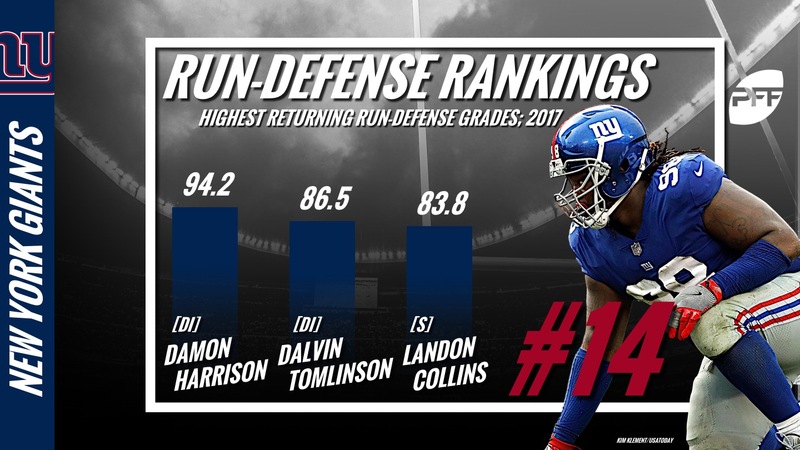 The Colts run defense would be ranked much higher if they re-signed defensive tackle Johnathan Hankins, who earned a 90.0 run defense grade last season – the third-highest among defensive interior players. To pick up the slack, they’ll need Margus Hunt to build upon his career year that saw him earn an 84.7 run-defense grade last season. The Cowboys run defense never seems to grade well, yet regularly gets good results. The reason is two-fold. The first is that they don’t really care about losing blocks and give their defensive linemen freedom to make plays when they see fit. The second is Lee, who’s 11.9 run-stop percentage led all linebackers last season. The Chiefs were obviously unhappy with their run defense in 2017 and showed it by signing inside linebacker Anthony Hitchens and taking back-to-back interior defensive linemen to kick off the 2018 draft. Run defense is one of the toughest things for interior defenders to master coming from college to the NFL though, so we’ll temper our expectations until they show it on the field. After losing Ndamukong Suh and his 92.4 run-defense grade, the Dolphins run defense could be ugly in 2018. Starting linebacker Kiko Alonso’s 5.3 run-stop percentage a season ago was one of the worst in the NFL while nose tackle Jordan Phillips 3.1 figure was even more unsightly.